You know that water is good for you. You have heard that drinking several glasses of water every day is a healthy practice. However, it's about time you learn about the harm that comes from having too much water and the ill effects it could have on you and your household. The first idea that comes to mind is a flood. This is surely an example of too much of a good thing. 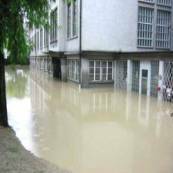 In low-lying areas, floods can be devastating and can destroy property quickly and with little warning. Unfortunately, just because the rain finally stops doesn't mean a home is safe from the threat of too much water. A homeowner must then extract the floodwaters from his or her home, and ensure that no valuables have been damaged. But the threat still persists. Even after the floodwater is dispensed, moisture can still build up in the walls as well as in furniture, carpets and other home furnishings. This moisture if ignored could lead to the buildup of mold and bacteria, which could become a serious health risk. Pollutants from moisture can also result from a ceiling or wall leak. Just a little bit of soaking goes a long way, and a very small ceiling leak on a rainy night could allow the infiltration of a lot of pollutant sources. Carpets are a common source of moisture buildup and can be partially soaked by just a tiny hole in the ceiling. Fire inside a home is also a major source of pollution long after the flames have died down. Damage can result from the soot or smoke of a fire, while left over moisture from fire extinguishers; fire sprinklers or firefighting hoses could also contribute to moisture pollution. Preventing the buildup of indoor moisture is very important because while some contaminants may cause just minor irritations, exposure to other kinds could lead to more serious conditions or respiratory diseases. The safe thing to do is to stop all forms of mold and bacteria from developing by eliminating the source of moisture. Don't panic! Water is still good for you but only when it is clean. Rainwater, floodwater, and indoor moisture on the other hand can be hazardous to your health.